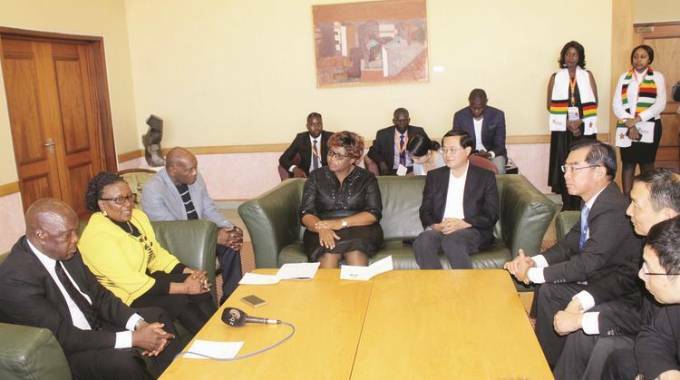 A DELEGATION of 60 Chinese Government and private business organisations arrived in Harare yesterday to scout for business opportunities as China positions itself for massive investment in Zimbabwe under the new dispensation. The delegation is expected to attend the Zimbabwe-China Forum today. Head of delegation, Mr Che Jun, who is the secretary of Zhejiang Provincial Committee of the Communist Party of China (CPC) and chairman of the standing committee of Zhejiang Provincial People's Congress, told The Herald yesterday he expected fruitful business engagements. "Zimbabwe and Harare are my first stop on my Africa trip. Once I set my foot on African soil I was impressed by the hospitality. Thank you for receiving me here. Two months ago his Excellency President Mnangagwa led a delegation to China and to Zhejiang," he said. "I was really touched by the invitation he extended to me. I decided to change my original programme of visiting Africa to include Zimbabwe on my visit. "I hope the meetings will go well. I brought with me not only Government officials, but a large delegation of business people." Mr Che said he was expecting successful outcomes on the business front in today's meetings. Special advisor to President Mnangagwa, who was also standing in for Foreign Affairs and International Trade Minister Sibusiso Moyo, Ambassador Christopher Mutsvangwa, said he was impressed by the quick reciprocal visit by Mr Che and his delegation. "Two months ago you were in your Zhejiang and we had very fruitful discussions. We did not expect that you would follow up on our visit so quickly. "This is an indication of the interest you have in my country and also the support you are giving to my President and also that President Xi Jinping could authorise the visit of your people to Zimbabwe is a reflection of very strong and warm relations between the two countries," said Ambassador Mutsvangwa who served for many years in China. "As former ambassador to China, I know the business prowess of Zhejiang. Most of the successful companies which China has spawned in the last 38 years the biggest are in your city, in your province, Alibaba and all the big names." Ambassador Mutsvangwa said Zimbabwe was looking forward to improving and reviving its economy and wants to work very closely with Chinese entrepreneurs as well as Government. He said there were a lot of opportunities in Zimbabwe which is aspiring to become a middle income economy by 2030. Ambassador Mutsvangwa said Zimbabwe could achieve such development much quicker if it walks with China. Tourism and Hospitality Industry Minister, Prisca Mupfumira, Harare Provincial Affairs minister, Miriam Chikukwa and Zimbabwe Tourism Authority chief executive Karikoga Kaseke, welcomed the delegation.